Join the discussion on our forums! 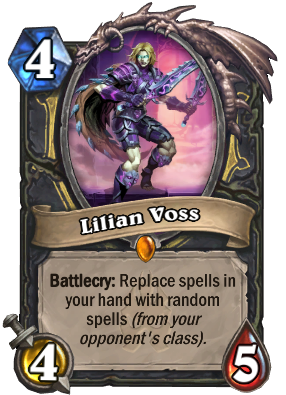 Come discuss Lilian Voss over in our dedicated Lilian Voss discussion topic. I feel like this should have either had a discount on the new spells, or turned them into Death Knight spells. I just got it from the pack, should I disenchant it? I play mostly Handbuff Paladin and Midrange Hunter. My opponent transforms into Lord Jaraxxus. She makes a Sacrificial Pact for me. Does nothing if played against the Lich King. Surprised it wasn't mentioned here - flavor text is a reference to The Terminator. This needs to also have (those spells cost (1) less) or maybe (2) less for this card to actually be useful. Currently you need a bunch of dead spells in your hand, play Lilian then play Ethereal Peddler and if RNG is good you will end up with good value. Dude, this card could be good if the Battlecry was ''Fill your hand with random spells (from your opponent class)'' or at least, ''Put 3 random spells in your hand (from your opponent class)''. Yes, she needs a buff, but that would be ridiculously OP. It would be op only against Mage. The other classes have very situational spells. Thank Blizzard for the 400 dust. First game I used her, got three dinomancys. Instant concede. Great value. 58,4% said playable or better, what are you talking about?